Spoiler alert: Gone Home wins. I will spend the rest of this post trying to justify my position. But you know what? Let's pretend it's still anybody's game, because I want to show you how I came to this decision. And where would that put us? For starters, it would give us two games that look the same at first, play the same at first, and end on different notes leaving incredibly different impressions. But why? What do they do differently? And why choose Gone Home? All of these questions will be answered eventually, but first, let's see what we're dealing with. It's funny, because from a distance, from a purely mechanical standpoint, you'd think they were the same game. Two first-person PC games, heavy on the backstory, thick with environmental storytelling, light on the controls. No jumping or shooting here; only what you need to unravel the events that unfolded before the game began, which are, of course, always interesting. Also, both of them are beautiful. But not the same kind of beautiful. Granted, they both put their all into getting their unique brands of beauty just right, every polygon, every line, every gameplay constraint, every perfectly placed musical riff. And both succeed. But do they hold up to each other? Maybe not. I played through Gone Home over Christmas vacation, and it was...something else. You don't really need me to tell you what the game's about, do you? It's very, very well-covered. Even here. But if you have to know now, and I'm not sure how much this will spoil things for you (so you should skip ahead anyway if you're particularly sensitive,) let's just say it's a love story and leave it at that. And... it was the better game. Where to begin? Dear Esther on the one hand was gorgeous-looking and gorgeous-sounding. Lush, lonely Hebredian island, slow piano accompaniment. That kind of beautiful. Aesthetic beautiful. It works. The bird itself could be a representation of the protagonist shedding their troubles and being granted freedom like a bird has the freedom to fly wherever they choose. From a spiritual perspective it could also be a transformation into a form of celestial being equivalent to an angel, them leaving the island moving on to a life after death. This could possibly imply that the island is a form of purgatory, perhaps a personal purgatory for the Narrator or Esther and the protagonist has to overcome their troubles and grief of their loss. And really, I don't know. What happens when we finally break this game down enough to know what it's really about? Would it be something useful? Revelatory? Relevant? Hollow? Empty? To be fair, there are two sides to everything, as usual. Ambiguity is nice. But all tropes can be used irresponsibly. And sometimes people do that. At least Dear Esther seems to know what it's doing. There have been worse things out there. There is an oncoming set of games that are equally ambiguous or profound-sounding but ultimately empty, like the admittedly very pretty Memories of a Broken Dimension. Pictured: Memories of a Broken Dimension. Who knew glitches could look so dazzling? The problem with games like the one above is that they take up the trappings and tone of a work of art with a clear message without really having one, instead creating layers of mystery, melancholy and ambiguity to cover it up, adding up to a sort of false poetry (this one's even got a flashy title!) There's a word for that. It's called kitsch. Kitsch is just another step we've taken in our attempts to make our games feel more grown-up. Before it was blood and gore. Then it was gruff, gritty anti-heroes, and "realistic" shades of brown. Now it's false poetry. It is a slightly more dignified strategy, but one no less disingenuous. And it reflects both our overwhelming urge to be taken seriously and our tendency to take the easy way around it, which has, by the way, never paid off. It's sort of like, and forgive my bluntness, but this is just too perfect an analogy. It's like that child that goes around trying to impress adults by wearing fancy suits and using big, long words that they may or may not understand. And the kid still throws tantrums and screams "MINE!" But, you know, with class. And in the other corner we have Gone Home. I think the most important thing about Gone Home is that as an art game and a game that was obviously intended to be one, it was surprisingly honest. When you're spending the entire game being spoon-fed backstory and submerged in plot-relevant objects, it's not easy to miss the point of the story. And I mean that in the nicest way possible. Thank heavens we didn't miss it! It is also the antithesis to the impenetrable arcanity of games like Dear Esther. I'm all for high concepts, and they are indisputably important in all art. However, in our rush to mature we seem to have forgotten Uncle Tom's Cabin and headed straight for Magister Ludi. But although stories like the one in Gone Home aren't waist-deep in advanced philosophical ideas, they have another equally important strength: They are accessible. They will be what the masses learn from. And they will be considered relevant. "Relevancy" is the key word here. High art contributes, informs. Even the worldbuilding is more relevant in Gone Home, chronicling a movement with parallels to the paradigm shift undertaking gaming and the rest of the media right now, contributing to our understanding of our position in history, informing us that change so often bubbles up from the underground, and is always sorely needed. It isn't mystifying or profound, but darned if it doesn't matter. One of the songs featured in Gone Home. 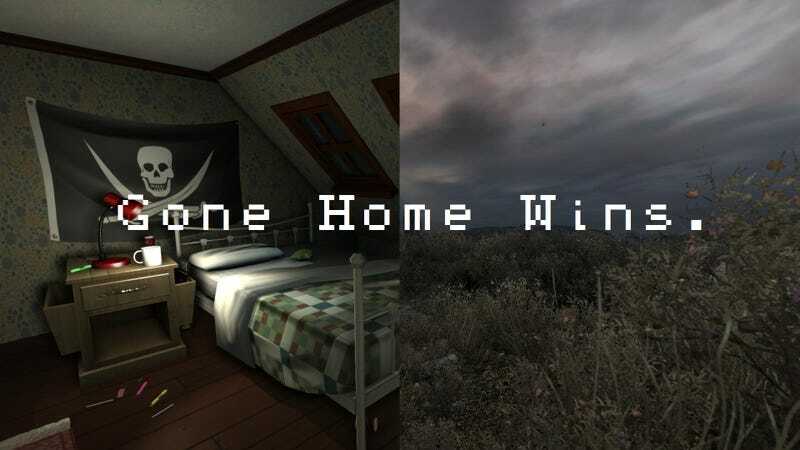 All in all, Dear Esther is a reflection of what we want games to be, while Gone Home is more what we need them to be. And it's such a shame that fewer games are going for that. We definitely know what we want to be. We want to be Dear Esther. We want to be Memories of a Broken Dimension or Passage or The Path. Dark, erudite, edgy, undeniably for grown-ups. Only. But doesn't anyone want to be Gone Home? That game isn't kitschy, it's classy! Kitsch is what results from a misunderstanding of what art looks like. But what does art look like? Art looks like everything. Art is everything. It is the recorded dreams and experiences of everyone on the planet, from every viewpoint on the planet. It's not about looking sad, mysterious, serious or even professional or polished. Art can be warm, or nostalgic, or familiar. Art can take place inside a house. It can be about an ordinary high school student. It's about what you take away from it, what you find yourself thinking about as the lights go down by your bedside long after the game itself is over and done. And at least I know I took something away from Gone Home. I learned something. But it gets even better. This isn't a game with centuries of backstory or fantastic locations or elements of the supernatural. It takes place inside a house. And that is wonderful. To be able to humble down and go with such an intimate, deeply personal story is, in this day and age, when even film and television have, by and large, gone the route of high-stakes, earth-threatening spectaculars, an achievement, not just for video games but for entertainment itself. Why does every story have to be an Earth-shattering epic? And, to be completely and totally presumptuous, I think we need more personal stories, especially in games. After all, I doubt we were meant to run on these kinds of emotions, the kind that come from being Humanity's Last Hope and watching the world hang in the balance. Haven't we always been creatures of empathy? Think about it. The universe is so huge that the number of atoms contained in it is a number that we can't even pronounce, and that makes us so small in the grand scheme of things, and our species may live out its entire lifetime in isolation, and on top of that, there are more and more people who, myself included, don't have the luxury of knowing where they're headed after the die. It's amazing how nihilistic we aren't. How then can we even think to assign value to anything on our planet? What do we have then, when all other values have eroded away? Love. Empathy. Empathy is all we have. The thing that's kept us moving is knowing that there are people you care about and people that care about you, and that those people matter and are worth living for. And for that instant, that person is the most important thing in the universe. The greatest crime we have ever committed was to deny someone empathy for being unlike the people around her. The most important thing we as a society will ever do will be to appreciate people different from ourselves. And it is here where Gone Home excels most of all. ...And all that said, it's still just my opinion, and I'm open to alternatives. So which game do you think is better? Sound off in the comments below, and don't forget to back up your argument! As per usual you'll find this on my Wordpress blog (which I'm in the process of shutting down,) and my Tumblr blog (Which I'm in the process of starting up.) You'll also find a comprehensive list of my writing over at my Kinja. You can even zero in on the game stuff using the tag "Radical Helmet Special." Thanks for reading! And now, after everything you've been hearing about this game...wouldn't you like to try it for yourself?